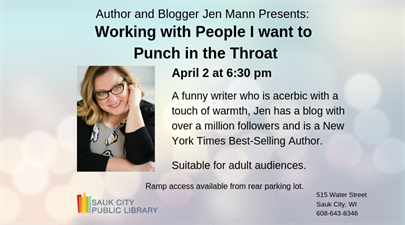 Author and blogger, Jen Mann talks about how she went from a work-at-home mom with two little kids and a husband who drove her batty, to a New York Times best-selling author with a full-time writing career and over one million followers on social media. Suitable for adult audiences. In addition to her blog, People I Want to Punch in the Throat, Jen Mann has also written for The Huffington Post, Babble, Circle of Moms, and CNN Headline News. She was voted one of Circle of Moms Top 25 Funniest Mom Blogs for 2012 and 2013 and chosen by the same site as one of the “Most Influential” bloggers. She was a BlogHer Voice of the Year in 2012 and 2013 and was a finalist for two Bloggies in 2013 (Weblog of the Year and Best Parenting Weblog). In 2012 she self-published a debut collection of essays, Spending the Holidays with People I Want to Punch in the Throat. She lives in the suburbs of Kansas with her husband (aka “the Hubs”) and is the mother of two children, whom she calls Gomer and Adolpha on her blog. She swears their real names are actually worse. 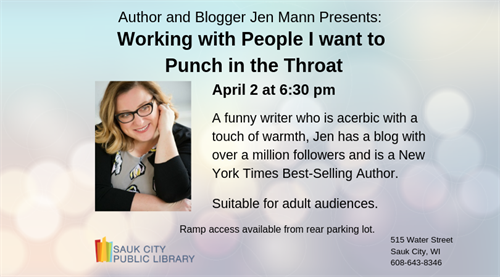 Visit her blog at http://www.jenmannwrites.com/.